Israel: India’s Soviet in the 21st Century? Home / Bilateral Cooperation / Geo Politics / India / Israel / Opinion / The Middle East / Israel: India’s Soviet in the 21st Century? Pandit Deendayal Petroleum University, Gandhinagar, India. However strongly we might reject it, India’srecently increasing closeness to the U.S. and other western powers has irked its ‘all-weather friend’ Russia to a great deal. There have been statements rejecting any stress in the relations between the two from both the sides but one can easily read between the lines. Russia’s elevating relation with Pakistan is the first manifestation of this strain which can also be seen together with its warming up with China. Moreover, the fact that India’s increasing role in global geopolitical and economic issues has invited new and grave challenges calls for strategic friendships with not only the conventionally powerful nations but also the unconventional and unexplored relationship avenues. One among many such prospective avenues would be Israel. India and Israel have come a long way in their relations since their inaugurations as sovereign nations. India, which vehemently and fundamentally opposed the idea of a state based on religion (which was also the reason for the formation of Pakistan) did not recognize Israel until 1950 and established the formal diplomatic relations only in 1992. This was, in the words of Nehru, “because of our desire not to offend the sentiments of our friends in the Arab countries”. This appeasement towards the Islamic world also sprouted from Nehru and Indian National Congress’ political needs at home where they considered Israel as a catalyst towards offending its Muslim vote bank. However, India has been engaging with Israel on agency and bureaucratic levels. The most important association has been between RAW and MOSSAD who are believed to have deep and covert intelligence sharing relationship with each other. Other portable and probable reason for this covertness would be India’s need for oil from the Gulf nations and hence the need to keep them happy by not engaging with Israel. The practice went on until NDA government under AB Vajpayee sent its Foreign Minister Jaswant Singh on a state visit to Israel, the first high-level delegation from India. Today, India is the largest buyer of Israeli military equipment and Israel is the second largest defense supplier to India after Russia. There are other avenues for the partnership like diamonds, agriculture, and technology. The Jewish state, after Modi’s recent visit, has shown the signs of an unbound partnership. India has been facing an increasing disturbance from its neighbors – China and Pakistan who have boosted their relationship by leaps. Russia would have been the traditional choice to counter this axis in South Asia, but looking at its bettering relations with China it is unlikely that there would be an unconditional support from Putin led nation against China in times of peril. Though there are next to zero precedents for doubting Russia’s allegiance to this all-weather friendship, India chose to have options ready in its kitty. This made India look towards US of A which would be a reliable partner until and unless it’s economic and geopolitical interests are guarded. The reason why the U.S. could falter going against China in all front war is its reliance on the Chinese economy and the U.S. is far too pragmatic to stake its own interests for an ally, leave alone a ‘friend’ or ‘partner’ (which Russia has). This leaves India to look for a partner with proven military strength and loyalty. A full-fledged and independent relationship with Israel looks promising to the extent of it being India’s Soviet for this century. So, what are the reasons that can echo the same even more convincingly? First, Israel has and will provide an unwavering support for India on Kashmir issue. With the exception of Iraq, Organisation of Islamic Countries (OIC) has always supported Pakistan’s position on the issue. The Arab or Muslim countries may be India’s strong partners when it comes to trade and economy, but as soon as the issue is Pakistan and Kashmir, it is not hard to see where the loyalties lie. It was Bahrain which in October 2016 issued a statement rejecting Pakistan’s labeling of terrorists in Kashmir as freedom fighters. But, it still does not change the fact that Israel can be the invaluable partner in the Middle East that India has been yearning for. India is seasoned at parallel and multi channel diplomacies and therefore has the capacity to maintain relations with the Muslim States while strengthening the ties with Israel. It has already done so, the Kashmir and Pakistan issue notwithstanding. Second, the full-fledged two front war with China and Pakistan that India may have to engage in will be difficult to win without powerful allies on the side. The traditional ally Russia may not be sufficient and hence Israel can be the decisive piece of the puzzle. Rest of the West led by the U.S. is unlikely to come out in an unwavering military support while the vocal and moral backing will not suffice in the peril situation. The current standoff between India and China at the Sikkim border is nothing but a signal of the impending hostilities. The situation on Indo-Pak border is already volatile enough to turn into an upscale war sooner than later. Here, Israel is the obvious choice for an ally that can be called upon while being sure of being heard and answered. Third, India and Israel have openly come out against terrorism, the latest being during PM Modi’s visit to Israel. Deputy Director General of the Israeli Foreign Ministry’s Asia-Pacific department Mark Sofer said, “As opposed to a number of other countries in the world, Israel has never hidden the fact that it supports India hook, line, sinker on the subject of terrorism. The horrors coming out of Pakistan, from the Lashkar-e-Taiba are known, and we support India’s right to defend itself against terrorism just as Israel has the same right.” Tackling the incidents of militancy in Kashmir, Northeast, and the Naxal Corridors will be more efficient if the intelligence sharing with Mossad and the tactical support from Israeli forces is amplified which faces the same challenge with Hamas group. Fourth, Israel has been called the capital of innovation and when complemented with India’s technical expertise, it can do wonders for both the nations. This may be fruitful not only in the defense sector but in others too. Renewable energy is one such sector where India’s potential and Israel’s innovation can help to quench India’s dire need for energy. Space is the sector where India is already assisting Israel in launching its satellites and in return getting support from those satellites. India and Israel are leaders in the diamond industry and cheap job work in India has encouraged Israeli’s to export diamonds to India for polishing. Further research and collaboration here can open new possibilities. Fifth, India’s increasing bilateral and multilateral ties with the west go well in sync with its relations with Israel. The imbalanced and biased bashing of Israel is being increasingly criticized by these western powers. If not the punching bag, Israel has at least been the favorite villain of the United Nations. The very same nations whose own human rights records ought to be checked are the ones pulling up Israel. India can become the voice of reason and balance the approach here. Not that India must overlook any human rights violations but India and Israel can together check the biased ganging up of Islamic nations against India for Kashmir issue and Israel for Palestine issue. Israel has also conventionally backed India’s candidature for the permanent seat at the UNSC. Sixth, India’s closeness to Israel is more acceptable to Russia than with any other western power. Russia and Israel may have been on opposite sides during the cold war and various other times, yet they enjoy cordial relations with each other. Therefore, there will be nothing that India will lose with Russia while closing in with this western power. Israel is a perfect balance for roping in the West and Russia and perhaps is the only western country whose closeness to India may not bother Russia. 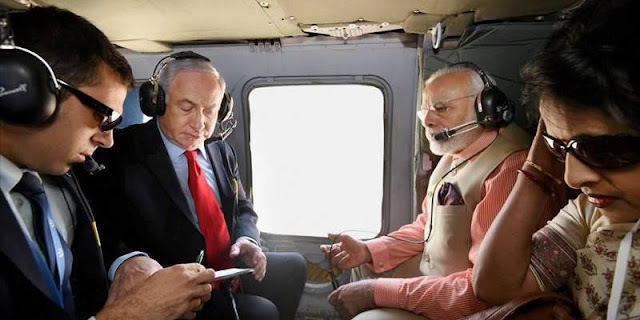 Seventh, areas of soft coordination like Bollywood and tourism are to be explored, though Israelis after their compulsory military service have developed a custom to visit Indian hill stations in Himachal to revitalize through spiritualism and even in Goa. The people of Soviet regarded Raj Kapoor with great reverence, even so, today. Similarly, in Israel, the popularity of Bollywood has been increasing and this can be determined by the fact that Dil to Pagal Hai was houseful for three weeks in Tel Aviv where its songs can be heard on the radio almost every day. Israel also has Hot Bombay and Yes India, two channels dedicated to Indian films that have been running regularly in Israel. The love for India and its people can also be found in Israel because of the shared history of Judaism and Hinduism. Jews in India have lived here for over 2000 years but never faced any discrimination and this fact contributes to the ultra-positive view of Israelis towards India and her people. Deriving from Netanyahu’s words, “When I do a relaxing tadasana pose in the morning and I turn my head to the right, India is the first democracy that I’ll see. And when Prime Minister Modi does a relaxing pose of vasistasana and he turns his head to the left, Israel is the first democracy that you can see”, it can be said that Yoga will, today and in future, link India and Israel. Even Indians have the largely positive view towards Israel and possess an increasing sympathy for the tiny state. Nehru when inching closer to Soviet added a personal touch to the Indo-Soviet relations. Modi can be the leader to do something similar for India with respect to Israel. Leaders usually shape the nature of a nation and its stances, may it be Nehru’s socialism or Modi’s machoism and charisma with Soviet and Israel respectively. Reservations regarding Israel being a Jewish state deserve no more than mockery. India’s Muslim population is mature enough to understand the equation. India had no qualms in engaging diplomatically with other Islamic states, it shouldn’t have any for Israel too. So with personal engagement of the leaders, cooperation in military, intelligence, and space sector, reciprocating positive perceptions of the populations, will Israel be India’s Soviet in the present times? May be if Modi plays Nehru. Both the leaders had an overwhelming support from the populace and just as Nehru then, Modi is the unparalleled leader in India today. Therefore, along with the parliamentary strength, he also has the necessary moral mandate in the country to charter a new direction and takes tough foreign policy decisions. The bettering relations with Israel can also serve Modi in the course of leaving a permanent imprint on India’s foreign relations as Nehru did.